America was flying high in the Roaring Twenties. Then, almost overnight, the Great Depression brought it crashing down. When the dust settled, people were primed for a star who could distract them from reality. Enter Gypsy Rose Lee, a strutting, bawdy, erudite stripper who possessed a gift for delivering exactly what America needed. With her superb narrative skills and eye for detail, Karen Abbott brings to life an era of ambition, glamour, struggle, and survival. Using exclusive interviews and never-before-published material, she vividly delves into Gypsy’s world, including her intense triangle relationship with her sister, actress June Havoc, and their formidable mother, Rose, a petite but ferocious woman who literally killed to get her daughters on the stage. 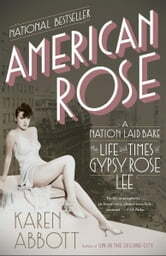 Weaving in the compelling saga of the Minskys—four scrappy brothers from New York City who would pave the way for Gypsy Rose Lee’s brand of burlesque and transform the entertainment landscape—Karen Abbott creates a rich account of a legend whose sensational tale of tragedy and triumph embodies the American Dream. This book is a biography of America in the 20s and 30s as well as that of a young girl pushed into show business by a formidable mother. There is rivalry between Gypsy and her sister exacerbated by the mother. Nevertheless Gypsy becomes very successful and famous as a burlesque entertainer with her own special style. She has many personal identity struggles, competition with her sister, her mother's selfishness and desiring more respect for herself and her craft. A well written description of the times as well as a personal biography.